Rotherham United beat Brighton & Hove Albion to boost their Championship survival hopes and confirm bottom club Blackpool's relegation to League One. Matt Derbyshire put the Millers ahead inside the opening 10 minutes, diverting Jordan Bowery's cross beyond goalkeeper David Stockdale. Baram Kayal and Craig Mackail-Smith wasted Brighton's best opportunities in the second half. Blackpool, who face Reading on Tuesday, are down with six games still to play. Lee Clark's team have endured a miserable season, bottom of the table since October and without a victory in their past 12 matches. It was left to Rotherham to seal their fate, Steve Evans's side producing a hard-fought display to edge past Brighton and pull themselves seven points clear of the relegation zone. Derbyshire's tidy finish set the Millers on their way during an uneventful opening period in which the Seagulls offered little threat going forward. But Chris Hughton's team were much more dangerous after the interval, with midfielder Kayal unable to beat goalkeeper Emiliano Martinez when through on goal and Bowery almost turning Leon Best's cross into his own net. At the other end, Derbyshire had a great opportunity to double the home side's lead on the break, only denied by Stockdale's fine save when one-on-one with the goalkeeper. And, after substitute Mackail-Smith's effort was kept out by Martinez, it was Rotherham who again came closest to finding the net, as Danny Ward's effort struck the outside of the post following more good work from Derbyshire. "We don't get deluded - there are no easy games in the Championship. In terms of match pressure it was up there with the play-offs. This was an important win. "Had Brighton equalised then I think the supporters would have gone out disappointed but knowing that they had had a proper return from their players. "There's a real cause and a real togetherness among our supporters. Our supporters demand that we give everything we've got and that's what we do." "We weren't good in that first-half period. Probably in the end I can't say we deserved to get anything out of the game because of our first-half performance. "We need to start better in games and we have got to be more productive in that final third otherwise we will put pressure on ourselves. Our work in that final third has got to be more productive. "It was too comfortable a goal to score. The lad crosses it from the angle and we have got to do better to stop the cross and be brighter and expect runs in the box." Match ends, Rotherham United 1, Brighton and Hove Albion 0. Second Half ends, Rotherham United 1, Brighton and Hove Albion 0. Attempt saved. Matt Derbyshire (Rotherham United) right footed shot from the left side of the box is saved in the bottom right corner. Offside, Brighton and Hove Albion. Dale Stephens tries a through ball, but Joe Bennett is caught offside. Offside, Rotherham United. Ben Pringle tries a through ball, but Matt Derbyshire is caught offside. Danny Ward (Rotherham United) wins a free kick in the attacking half. Attempt missed. Danny Ward (Rotherham United) left footed shot from the left side of the box is close, but misses to the right. 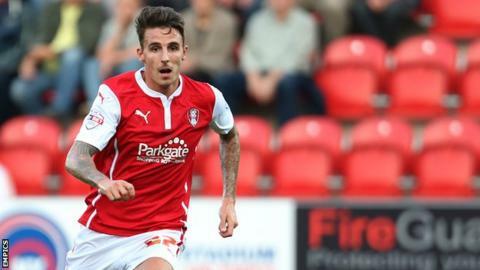 Assisted by Matt Derbyshire. Matt Derbyshire (Rotherham United) wins a free kick on the left wing. Attempt blocked. Joe Bennett (Brighton and Hove Albion) left footed shot from the left side of the box is blocked. Assisted by João Teixeira. Offside, Rotherham United. Kári Arnason tries a through ball, but Matt Derbyshire is caught offside. Attempt missed. Craig Mackail-Smith (Brighton and Hove Albion) left footed shot from outside the box is high and wide to the left. Substitution, Brighton and Hove Albion. João Teixeira replaces Mustapha Carayol. Foul by Mustapha Carayol (Brighton and Hove Albion). Jack Hunt (Rotherham United) wins a free kick in the defensive half. Corner, Brighton and Hove Albion. Conceded by Richard Smallwood. Substitution, Rotherham United. Danny Ward replaces Jordan Bowery. Attempt saved. Craig Mackail-Smith (Brighton and Hove Albion) right footed shot from very close range is saved in the centre of the goal. Assisted by Beram Kayal with a cross. Offside, Rotherham United. Daniel Lafferty tries a through ball, but Matt Derbyshire is caught offside. Attempt missed. Mustapha Carayol (Brighton and Hove Albion) right footed shot from the left side of the box is close, but misses to the left. Attempt missed. Kazenga Lua Lua (Brighton and Hove Albion) right footed shot from the centre of the box misses to the left. Attempt saved. Matt Derbyshire (Rotherham United) right footed shot from the left side of the box is saved in the bottom right corner. Assisted by Daniel Lafferty. Attempt saved. Jack Hunt (Rotherham United) left footed shot from outside the box is saved in the bottom right corner. Assisted by Jordan Bowery. Attempt missed. Kári Arnason (Rotherham United) header from the left side of the six yard box is too high. Assisted by Ben Pringle with a cross following a corner. Corner, Rotherham United. Conceded by Lewis Dunk. Attempt missed. Jordan Bowery (Rotherham United) right footed shot from outside the box is close, but misses to the left. Assisted by Matt Derbyshire. Matt Derbyshire (Rotherham United) wins a free kick on the right wing. Corner, Brighton and Hove Albion. Conceded by Jordan Bowery.